Come out this Sunday evening, August 26th, at 7:00 PM and make history with the Tea Party Express mobile phone bank bus hosted by Gainesville Tea Party. Come and make some phone calls with us to help get out the vote in the most important election of our lifetime. Sacramento, CA – Tea Party Express launched its newly debuted Mobile Phone Bank Bus on an 81-Day Get-Out-the-Vote campaign that aims at engaging and educating conservative voters in the November 6th election. The tour will stop in 23 states that are the key battlegrounds in the 2012 election. The first part of the tour will focus on recruiting and organizing an army of grassroots activist that will commit to participate in an extensive phone-from-home program. As the election approaches, this program will be activated and will aim to make the millions of calls required to get tea party fiscal conservatives out to vote. 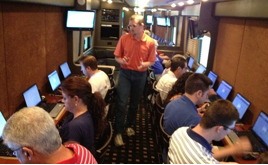 The Mobile Phone Center Bus will give local tea party volunteers an opportunity to utilize the state-of-the-art technology to make calls recruiting activists to get involved. The bus is equipped with 15 workstations, each with its own laptop and phone. The GOTV campaign will travel the nation from now until the election with the goal of reactivating the passion and excitement that was so powerful in 2010. Note: This is a phone banking and get out the vote rally where local residents will have the opportunity to come aboard the Tea Party Express bus and work with the pros. Callers can alternate in short shifts, so that many people will have the opportunity to make calls. There will be great fellowship and camaraderie but this is NOT a music and speeches rally. This entry was posted in 2012 Elections, Major News Items, Tea Party. Bookmark the permalink.